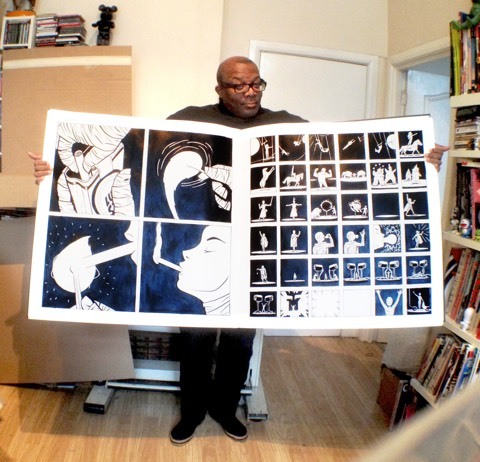 Few creators have been stretching the capacities of comics to fully involve the reader as persistently as London-based all-rounder Woodrow Phoenix. 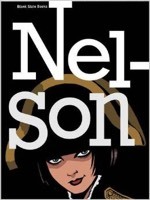 From his New Wave roots in Fast Fiction, the UK’s small press scene in the early 1980’s, through such genre mashups as Sinister Romance (1988) or Sugar Buzz (1998), or co-conceiving Nelson (2011, below), a fictional biography told in short stories, one per year, by multiple cartoonists, Phoenix keeps setting himself challenges to refine and re-define the medium, and exceeding them. 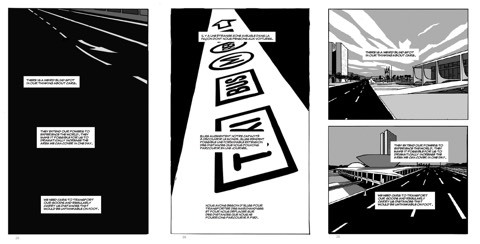 This skill is illustrated in his stand-out graphic documentary Rumble Strip (Myriad Editions, 2008), subtitled If you want to get away with murder, buy a car. Phoenix asks us to open the blind eye we seem to take to road deaths, which, reframed as ‘car accidents’, have become the almost acceptable price of our glamorised lifestyle behind the wheel. From his experience working on health education comics, Phoenix was aware of the problem of readers being unable to identify with a pre-set protagonist, often picked from a very narrow range of ‘types’. “If you don’t like the main character, then it’s difficult to get into the story or feel like it relates to you. Removing any visual anchors makes a space for the reader to project themselves into that narrative,” he says. In Rumble Strip (above), Phoenix straps the reader into the driving seat, and positions his verbal commentary in captions centre-stage inside the panels, so that they become an insistent internal monologue apparently pouring from the reader’s own mind. Looking out through the windscreen and through the eyes of this unseen, unspecified Everydriver, this is comics at their most subjective. Emptied of any other road users or pedestrians, Rumble Strip’s streetscape promises the ultimate solo ego-driven experience, the stuff of slick car adverts, Top Gear fantasies, and mounting fatalities. 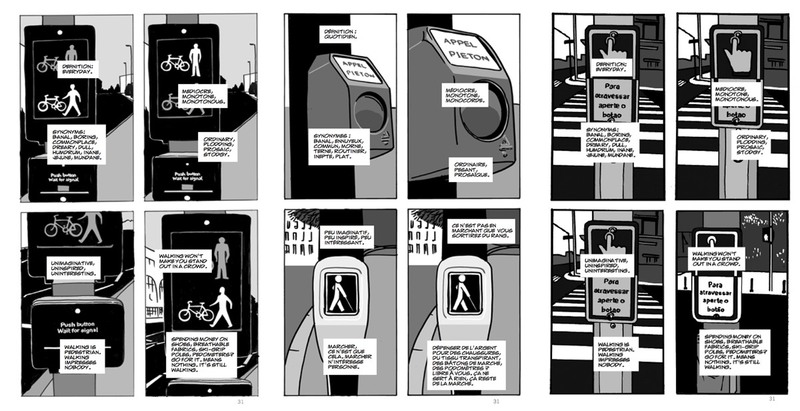 The book’s unconventionality has not prevented it from engaging diverse publics, as Phoenix appends extra signage and street furniture to localise translations and leads awareness-raising comics workshops about automobile safety in India and Argentina. SHE LIVES - a fast preview of a very big book by Woodrow Phoenix from superadaptoid on Vimeo. In ‘Numbers’ you use two highly contrasting techniques. Your first page avoids all human representation, you show the deserted street scene of the Charlie Hebdo massacre. In the second, you give faces to some of the faceless victims who stare directly at us. 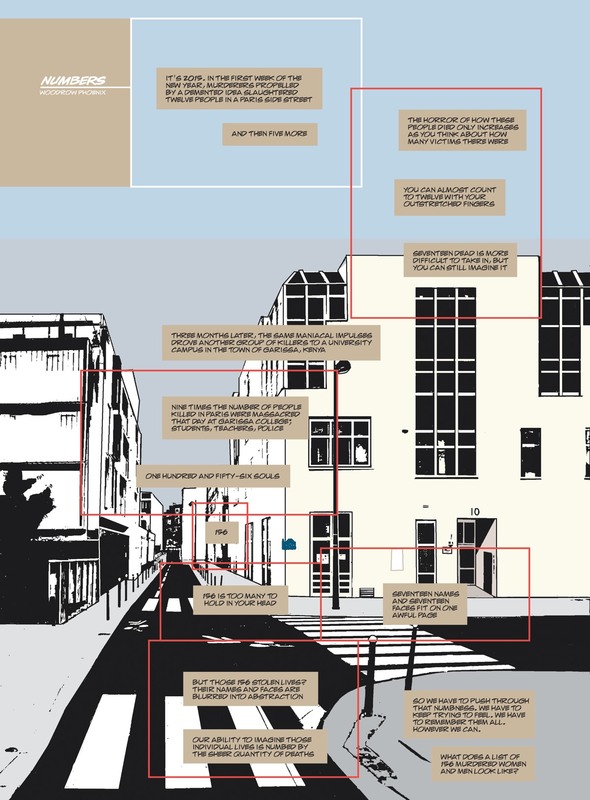 How do comics work best as ‘empathy generators’, to use your description? Do we need to see a protagonist and identify to empathise? In this case, showing the street without explicitly naming it makes you wonder what you’re looking at. When you realise it’s the building where the atrocity occurred there should be a moment of unease as you imagine what happened in this spot and what might have happened to you, had you been there. It’s a kind of forced identification that feels more personal than if I had a person relating their experience to you. Whereas for the second page I wanted to show you directly the people who had died, whose faces you are unlikely to have seen. 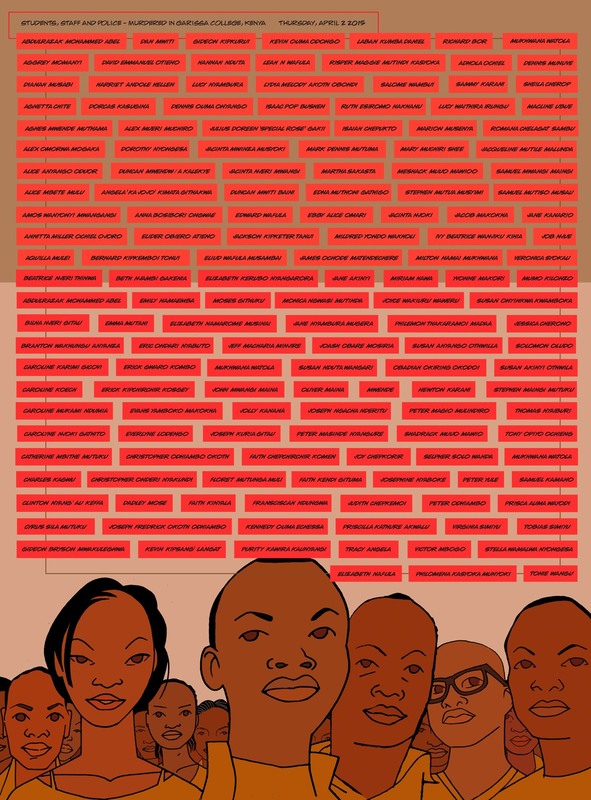 I had to search till I found a webpage set up by people in Nigeria that linked to a Google doc where they had complied this list of everyone who died, plus whatever photos they had gathered. I think it’s quite telling that this information was much harder to find than for the Paris victims. They are staring right at you because again, I want you to feel directly engaged by them. 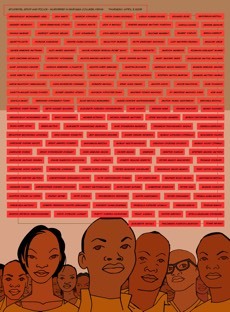 These are ordinary people who died for no reason. It could have been you. 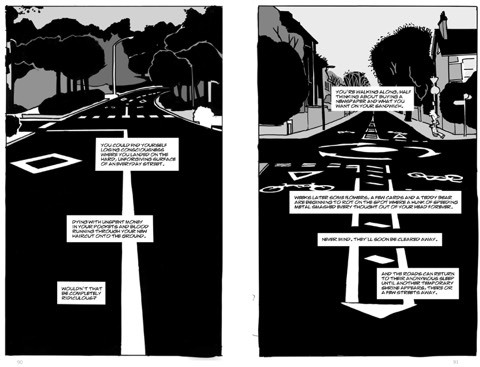 Rumble Strip is one of the few examples of subjective comics where we never see the protagonist - what are the problems of the lack of subjectivity in comics and how does your approach solve or overcome them? Popular media generally features a very narrow range of ‘types’ and comics are no different. If you want to make stories that literally anybody can identify with, you have to find ways to make them more inclusive. I’ve often talked about the problem of identification - if you don’t like the main character, then it’s difficult to get into the story or feel like it relates to you. So removing any visual anchors makes a space for the reader to project themselves into that narrative. I know a lot of people enjoy identifying with an idealised powerful and attractive protagonist and those people find the idea of Rumble Strip very odd - the pages are empty! There’s nothing here but backgrounds! But people who aren’t comics readers are less attached to one particular approach to narrative, they have different expectations and find that openness far more involving. I have found that Rumble Strip works especially well with older women readers, which I am really pleased about because traditionally they are the least interested in ‘typical’ comics. 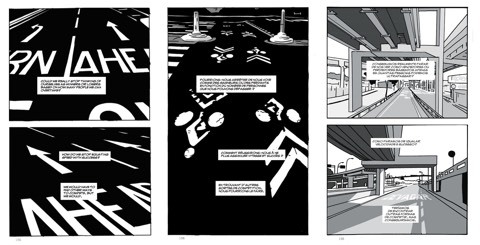 Could you tell me about how it’s been to adapt and localise Rumble Strip for foreign editions? Some examples of the issues and solutions you’ve come up with would be enlightening. The book is built around readers recognising the environments they live in and move through in the course of a day. A lot of traffic signage and street layouts are generic, but some features are specific to particular countries or cities. So I used many different locations to represent as wide a range of places and styles of traffic management as I could fit in. I had plenty of reference material even before I began, because I am always interested in the built environment, so whenever I go to a new city I invariably find myself photographing streets, signs and intersections. 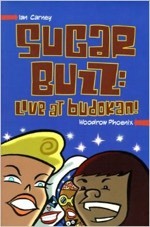 Locations in the original edition include various UK cities, Paris, Brussels, Rome, Tokyo, Los Angeles, New York and Minneapolis. The only problem for me is that in noticing how details can vary so much from one country to the next, I keep seeing new things I want to write about. The countdown timers that you see at pedestrian crossings now were in use in other countries for years before they arrived in the UK. I didn’t put any in at the time I wrote the book because we didn’t have many of them, but there’s a lot to say about them and the risk assessments planners work with. In London, one cynical by-product of introducing timers was to reduce the time pedestrians have to cross roads, in order to speed up traffic flow. When you look at those numbers going down as you cross you definitely don’t feel like a person of equal value to a driver, but like an irritant contributing to the impedance of road traffic. Grrr. Can you share any anecdotes from your travels and workshop experiences in India and elsewhere for Rumble Strip? How have these have worked out? I remember standing on the stage at the English faculty auditorium at Panjab University in Chandigarh, India. I often don’t know what I will say when someone asks me a question but I never worry about it anymore. I have been working in this medium for long enough to have a completely worked-out philosophy. But most of it is buried deeply in me on a level that I don’t need to access. So when these ideas come up to the surface, they can be a very different shape from the way they went in, years ago. Sometimes I surprise myself with the realisation that I have a very strong opinion on a topic that I hadn’t consciously examined. I really like it when that happens! Especially when it’s a coherent idea that has been properly worked out by the back of my brain. It’s like a little gift that I can share with my interlocutor. 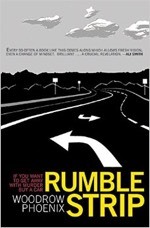 I was invited to spend a week in India talking about Rumble Strip at several author events, because the British Council saw how the book could be received there. Globally, over a million people die in collisions every year. And India is especially dangerous for road users. The incredible death rate from collisions on Indian roads is around 300 people every day, the highest fatality rate in the world. One of the people I meet is Harman Singh Sidhu. ArriveSAFE is an NGO set up by Harman Singh Sidhu to try and do something about the way people in India drive. Harman is in a wheelchair, the result of a spinal injury from a car crash thirteen years ago. He tells me his organisation has been campaigning for years to make people drive less aggressively. When he saw my book, he realised that what was missing from their activism was a way to get people to understand on a personal level why they needed to change their behaviour. I explain my decision to make the reader into the protagonist, so they experience the book actively rather than reading it passively. Herman told me how incredibly well it had worked for him and how he was excited to have a tool with which he could really change people’s minds from the inside out. This is going to save people’s lives, he says, holding the book. How did you come to do this? I tell him about my sister’s death, my friends who have been killed and permanently brain-damaged by careless drivers, and my own near-death experience. But it wasn’t until I made this book that I put all the pieces together and understood what they all had in common. We test a person’s mechanical ability to operate a machine, but their mental attitude is unimportant. Car crashes happen along the axis from impatience to obliviousness. People are rarely if ever held responsible for their behaviour in cars because driving is so demanding and they’re only human. That’s why we call them ‘accidents’ rather than ‘murders’. Sukhina Lake is a beautiful man-made lake set in parkland in the centre of Chandigarh that attracts thousands of people every weekend. So that’s why it was chosen for an event to mark the United Nations World Day of Remembrance for Road Traffic Victims 2009. I was invited to judge the results of a competition. ArriveSAFE, the British Council, the British Library in Chandigarh and CITCO invited students from the areas in and around Chandigarh to draw posters for “Road Safety: Our message to World Leaders”. Harman S. Sidhu and I picked six winners, three from each age category. Harman presented them with a “Road Safety Award” on behalf of ArriveSAFE and I gave them an autographed copy of Rumble Strip from the British Council and the British Library. Harman would take the posters to the First Global Ministerial Conference on Road Safety in Moscow the following weekend. After the judging we went out to an area by the lake where there was a mangled SUV in front of a backdrop highlighting the UN message. There was a big group of young people wearing ArriveSAFE T shirts and holding placards. We marched up and down beside the lake with groups of curious onlookers, photographers and reporters. Harman and I both explained to the TV crews what we were doing there and why. Photos were taken. And then it was time for me to leave. She Lives Timelapse 3 from superadaptoid on Vimeo. 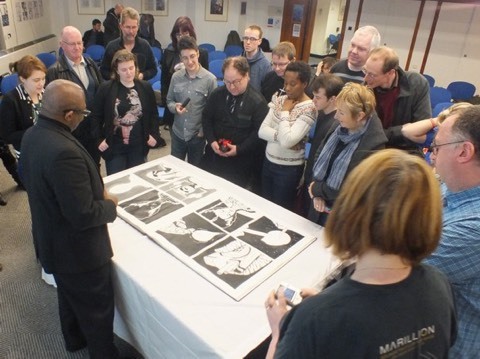 Let me ask you about She Lives: what have you learnt from the process of making this unique comic as art object - and from giving your shared public readings (see Dundee Comics Day 2014, and Wonderlands UK Graphic Novel Expo 2015 in Sunderland, below)? And how might you apply these lessons to a future project? She Lives was a test at solving the problem of reader attention: simply put, how do you make people slow down and look more carefully at images so they aren’t racing through and missing information? By a process of iteration I arrived at this giant art object, which then needed a person to present it to an audience of reader/viewers. It has been fascinating to observe people responding to the narrative in real time, which is an experience like theatre - the group responses have a logic of their own. It’s also amazingly satisfying to see that the story works as I’d hoped with the very large images alternating with smaller ones to hold people’s attentions and direct their gaze. I don’t know how much of this is transferable to standard comics-making but it answered the basic question of whether silent comics can work as well as regular ones. I was wondering if writing is becoming increasingly important to you, as you are sometimes working purely in words. Coming from making comics, how do you find writing your prose-only projects? Writing has always been important to me. I construct my stories with pictures as well as words, but they equally share the narrative load. It’s not a case of writing scripts then finding images to illustrate them, it’s expressing an idea using two complementary streams that merge into one narrative. When I do work that is prose-only, it’s because the idea is abstract enough that images are unnecessary or unhelpful. The big difference is that the words have to work harder. Rather than editing, editing, to reduce every sentence to its barest minimum, I can spread out and use all the adjectives I want. What are the most misunderstood aspects of the comics medium and how would you clarify them? I suspect your upcoming projects should remain shrouded in secrecy, but can you share anything about your plans or aims? I have been researching a book that’s going to be about newsmedia; how news is presented, how we consume it, how it shapes our perceptions. I don’t know what that’s going to look like yet, that’s a long-term project so it will be a while before I have to start nailing it down. The book I am writing right now is about comics as a medium. 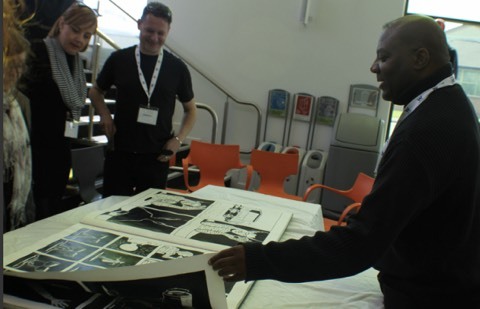 I will be exploring some of the things we have just been discussing, looking at how to make effective comics. That’s going to be published by Myriad Editions, next year if I can make it fast enough. Then there are a couple of smaller, simpler cartoony strips for a children’s comic. I really enjoy varied kinds of storytelling. I’m just going to keep experimenting with narrative forms, with finding the best or most involving ways to present stories. The main Article appeared in ArtReview Magazine, Summer 2015.